When the news broke yesterday about the fire at Notre Dame du Paris, I was eating lunch with students and a dear friend. As it became just how bad the fire was going to be, I confess started sobbing. 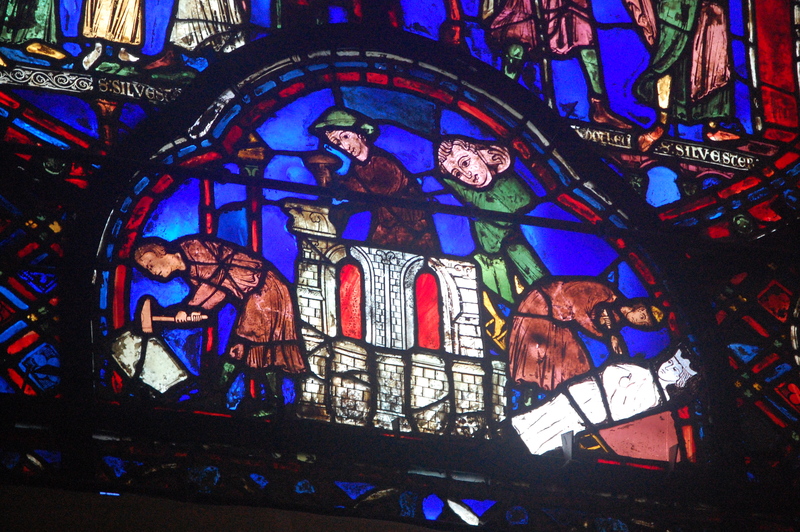 All I could think about was the generations of people across centuries who gave their time and labor and love to Notre Dame (and to all medieval cathedrals) and how they hoped so deeply and fervently that their small contribution would add up to something immortal. As I woke up today, news and pictures were trickling in of the church, still standing. I am amazed anew at the genius, skill, and strength of medieval builders, whose talents and imaginations soared. At the craftsmanship of these hand-made buildings, the forethought of the builders who prepared for partial collapses and who built in redundant protections of buttresses, walls, and vaults, and who hoped for eternity but reckoned with collapse. I mourn the contemporary destruction of living churches in the US south, shootings inside mosques and synagogues, and the deliberate murder of memory that takes place in war zones around the world, including the funerary shrines in Timbuktu and the Buddhas of Bamiyan. I mourned the destruction of loss of the Brazilian National Museum, and the Mostar bridge. (Hell, I'm a historian, I'm still grieving the burning of Persepolis by Alexander the not so Great). The destruction of the Great Mosque of Damacus put a hole in the fabric of art and religious history. All of these are tragedies, and all are catastrophic absences to the world and to their communities. Each loss is cumulative--we can and should care about all of them. But I've never cried for a building before yesterday. It is miraculous and wonderful that only one person was injured in this event, and that so much of the fabric stands. (Indeed, the medieval people I study would already be gathering witness accounts to write up the story to add it to Marian miracle cycles.) Notre Dame isn't even on my top-ten list of cathedrals. But what I mourn is similar to what is lost when libraries, museums, or art galleries burn, flood, are bombed--the loss of not just a single space or a set of contemporary lives, but the loss of the collective projects and stories of all of the unnamed, unremarked, unremembered people who literally built this with the work of their bodies. Medieval cathedrals were and are ideas in stone, stories carried over time, edited and retold and retooled. They were books--science, art, faith, music, legend, folklore---all are part of the walls and towers and floors and windows and ceilings of these buildings. They tell stories that are revised every time a new renovation happens. They keep reflecting reframing and remembering changing worlds. (There's an angel with a cellphone in stone at Sin Jan Cathedral in Den Bosch, and piece of the moon rock in a stained glass window at the National Cathedral in DC). They are representations of elite culture, yes, but they are also the embodiment and articulation of the stories and faces and worlds of thousands of others.....the masons and glaziers and carpenters and cartwrights and cleaners and cooks that collectively created these monuments, and the families they supported and who they often left for years at a time to follow the work of their trades. They are also the works of the butchers who worked to pay for a window, the women who sewed the tapestries and altar cloths, the sculptors (then and now) who put their loved ones' faces in stone in an effort to have their work and their loves in their life live after them.....that's why cathedrals matter. Not because they are famous, or because a single famous person is connected to them, or because they draw tourists, or even because many of them are still sacral sites--but because they mattered so deeply to the people who built them, rebuilt them, renovated them, painted them, put art in them again and again and again and constantly renew and remember their meaning. And for Notre Dame, that process will continue. As it has and will over centuries in cathedrals throughout Europe and in special places of power around the world. Some striking photos have emerged of the brave firefighters of Paris standing in the still surviving cathedral. The rescuers of cathedrals and castles are often commemorated in some way in the buildings. 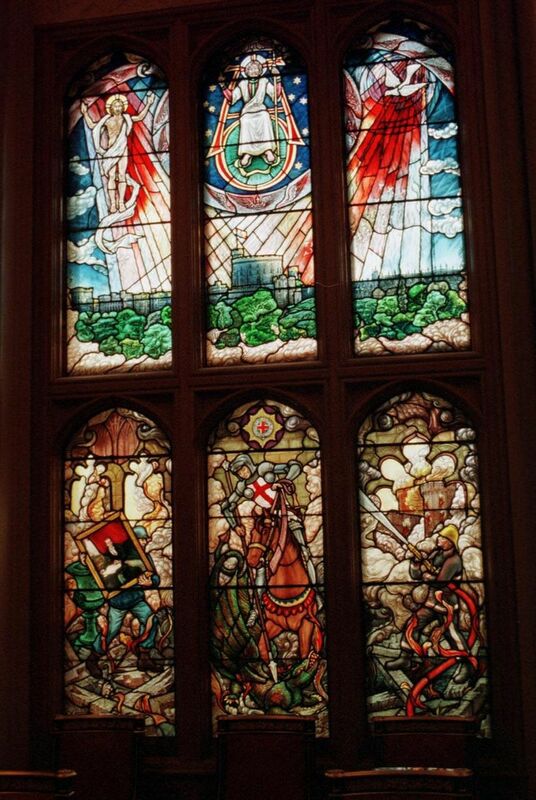 Paratroopers appear in church art in Normandy, the firefighters who saved Windsor castle and its art are in the new chapel’s stained glass, and many cathedrals that lost their glass in wars have commissioned artists to renew the glass art in ways that tell the stories of loss and recovery. Time will tell how we choose to tell this part of the building’s biography, but I have no doubt that in some way these firefighters will become part of not just the story, but the building itself.